The drama of HBO’s revisionist western was based (loosely) on real events, features historical figures, and is set in lawless territory that actually existed—a patch of gold-infested dirt that sat between Montana and Dakota. Milch, by his own admission, could have told his story anywhere, in any time period; he chose 1870s America, but later confessed he almost told his “universal” story about the chaos of society in ancient Rome. This means any echoes of this century are simply coincidental. And yet Deadwood seems to be so full of concerns that resonate strongly now, even more so than they did when the show first hit screens. Deadwood infamously ended prematurely in 2006, before Milch could wrap his opus up, and before some of the most important events of the last decade left the world in the state we find it in today. Deadwood was pre-ISIS, pre-Occupy, pre-Black Lives Matter. It ended before there was even a whiff of impending economic collapse. Back when Deadwood first aired, America didn’t appear quite so chaotic, and there wasn’t a president in the White House making gun control or institutionalised racism into priority issues. It was before the 2008 crash revealed the horror of inequality to so many, before Bernie Sanders went mainstream decrying the danger of the 1%. And yet all these concerns seem to be there on the screen, and on Milch’s mind, in Deadwood. The town itself is home to both extreme poverty and extreme wealth, with everybody left to effectively fend for themselves in a familiarly trickle-up system. Always-bubbling-underneath-the-surface racism is common and accepted and bullets fly regularly. Those who keep order—or those who keep the status quo at least, like Ian McShane’s Al Swearengen or Powers Boothe’s slithery Cy Toliver, the big ‘corporations’ that really run things behind the nominal ‘men-in-charge’—rule with virtual impunity. It’s more extreme, but in terms of fundamentals, it doesn’t sound a million miles away from the America we now see on the news every day. Of course casual bigotry, inequality, gun violence and the corporate stranglehold on the political process were still problems at the time Deadwood was made, but since ’06 it seems these things are vastly more pronounced. These are issues that are now never out of the headlines. And now, with cartoonish Republican candidates exploiting public fear of immigrants and Muslims more brusquely than any politicians were at Deadwood’s time of production, the insular town of Deadwood’s fear and mistrust of outsiders (policymakers, Pinkertons, the Sioux) feels more timely too. Most pertinent is Deadwood’s third—and at-present final—season, its finest. The dialogue is at its most intricate and luxurious, the production values are at an all-time high, the cast is more reliable than ever (and there’s a fine new addition in Brian Cox as the ringleader of a traveling theater troupe). Season three also introduces viewers to one of TV’s most despicable monsters: the murderous, uber-rich prospector George Hearst (played by Gerald McRaney). He’s a figure that, at the time of writing, was to Milch probably a general embodiment of the idea that ‘power corrupts.’ A figure who, in the wake of the financial crisis, now looks like a representative of all that’s wrong with the world. Like so many of Deadwood’s characters, George Hearst is based on a real-life figure, but in reality Hearst was no evildoer, just a shrewd businessman who had a nose for minerals, especially silver and gold. For fictional purposes, Milch made him into a cunning, hateful sociopath, one that uses his wealth and influence for bad, knowing there’ll be no repercussions. Season three sees the town of Deadwood at last coming under the rule of law, but even then Milch presents an America in which those with a certain amount of money and power are exempt from obeying rules that apply to everyone else. Hearst is a man who buys newspaper outfits just so they’ll write his propaganda, who uses his muscle to shut out the smaller-fry competition, who holds the lives of his opponents and his own workers equally cheap. Just as long as his bidding is done, Hearst doesn’t care who lives and who dies. He tears up the town, both literally and figuratively, partly to get at the area’s gold, partly just because he can. McRaney’s Hearst is a figure so uncompromisingly rotten that even the ferocious Al Swearengen inadvertently becomes one of Season three’s heroes. Al rallies together with the whole community to fight back against this establishment stand-in, and loses. You’d assume that Al, Deadwood’s unofficial lord and ruler, would emerge victorious by the season’s end, but the only winner at the close of Deadwood’s third chapter is Hearst, riding out of town richer and having claimed power over its helpless people. It’s one of the most stinging critiques of modern capitalism in television. Milch was probably just making a general point when he gave us Season three. (A proposed follow-up show called The Money, which went so far as getting an (unaired) pilot starring Ray Liotta and Brendan Gleeson, found Milch apparently tackling similar concerns: money, power, the media used as a tool by the rich.) But today, post-2008, with everyone so much more conscious of how the wealthy can trample over the rest for personal gain, Deadwood’s final statement-at-present is more relevant than when it first aired. Back in 2006, Hearst was simply a personification of the old adage ‘money is the root of all evil.’ We now recognize Hearst as one of the unfeeling sociopaths that crashed the economy eight years ago and left the world in the unstable condition it’s in now. 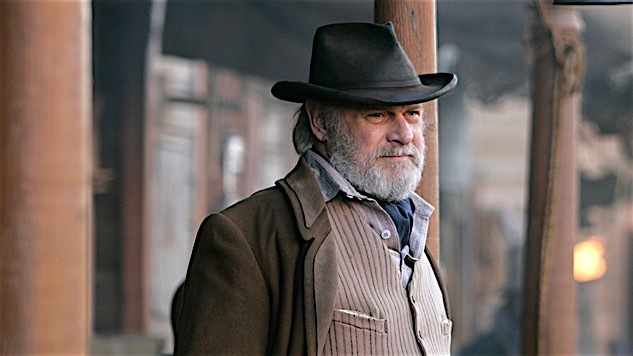 As Milch prepares to return to Deadwood and wrap his show up for good, a decade after it went on ‘hiatus,’ it’s interesting to think that Season three was never meant to be the ending. Deadwood wasn’t necessarily supposed to act as a reflection of contemporary America, nor was it meant to close as a pessimistic treatise on rampaging corporate greed. It’ll be equally interesting to see where Milch, returning to the show now in this unstable climate and age of establishment skepticism, chooses to go with the story threads he left dangling. Might Milch see a happy ending? Or is that just too much to ask in America?